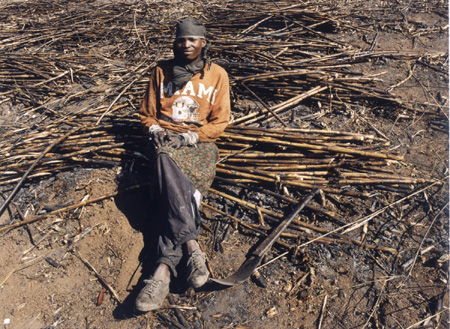 This small but powerful exhibition of seven chromogenic photographs of sugar cane workers in South Africa by Zwelethu Mthethwa is a must see. The show has been extended to Easter Sunday, April 8. There is an abundant blinding light that illuminates these workers, their clothes and tools, the ravaged sugar cane fields that almost appear to have been collaged into this lush landscape of golden green rolling hills. The cut sugar cane lies in stratified stacks like pick-up-sticks and it seems to grow as thickly as bamboo. The workers' hands are like oiled wood, they match their soiled work shirts. The workers gaze at Mthethwa. They stare at us. We are in those background hills of leisure and beauty, in another pastoral place. The workers are firmly there, with their machetes, their heads and wrists wrapped in cloth, their bodies layered in loose clothing to protect their skin from the sugar cane leaves as sharp as blades. This is a world of extreme light, extreme work, extreme contrasts. A black man is transformed into a shining silvery being because his skin is so slick with sweat it reflects the intense light - his skin suddenly metallic, alchemical. These men are tired and proud. Curator Diego Cortez links Mthethwa's work to South African photographer Pieter Hugo and to the Brazilian photographer Sebastiao Salgado, in terms of social narrative. I respect Mthethwa's deliberate decision to utilize color photography rather than black and white in order to "disarm the issue. We know South Africa through Apartheid. The history of photography is full of black and white images of poverty. I do not want to perpetuate this status quo." Cortez rightly claims that Mthethwa's work address the critical question of "how to provide greater dignity and realism to his subjects than that afforded by black and white documentary reportage as was prevalent during South Africa's historical transformation from apartheid to a free and open society." Mthethwa wants to make beautiful photographs, photographs that the sitters will love. Mthethwa quotes one of the sugar cane workers, "I want my kid to see me at work, but I want the photograph to stimulate her to get her education." As Roland Barthes writes in Camera Lucida, it is not the photograph that we see. I have come to realize that this is only true when we look at great photographs. What we see is what was once there before the lens, illuminated and temporary. While Mthethwa's large color photographs are gorgeous, I cannot remember how they were framed. What I remember is one man's blue-black hands folded in his lap as he sits on top of a pile of cut sugar cane. I remember looking down on a man standing in the shallow foreground of cut straw-like sugar cane, his machete held horizontally at his waist, his fingers shining, his soft blue hat punched through with holes that I imagine are for ventilation. I remember their weary and honest eyes. These moments provide moments of rest for the workers and articulate the entangled and divided realm of spatial politics in reality and in representation itself.